The Absolute Multiline Technology is a pioneering solution to the precision measurement of lengths up to 20 m with a measurement uncertainty of 0.5 µm per meter, on up to 124 channels simultaneously. Unlike conventional interferometers, the laser beam of the Absolute Multiline Technology can be interrupted at any time without causing precision loss. In fractions of a second the absolute distance is recovered. Thanks to these worldwide unique system properties, the patented Absolute Multiline Technology takes metrology automation in production to a new level. A single Absolute Multiline System can drive up to 124 measurement channels, depending on the system configuration. The channels are extremely compact: Each sensor consists of a commercial robust fiber and a miniature optical element without any electronic components. It can momentarily measure motions and vibrations of an object with a resolution of over several MHz during one measurement interval. As the distance between the sensors and the system electronics can be several kilometers, it is possible to conduct measurements under extremely rough environmental conditions, far away from the evaluation electronics. The sensor signals are not affected by electromagnetically noisy environments; therefore the placing of sensors in e.g. energy chains is possible without degradation of performance. The metrological traceability of the Absolute Multiline Technology is ensured by the reference to fundamental physical constants: In every measurement, the molecular absorption spectrum of a gas cell that stays constant over decades is scanned and the system is thus automatically recalibrated during every measurement. Comparison measurements using a conventional interferometer at the National Physical Laboratory in England confirmed a measurement uncertainty of 0.5 ppm (equivalent to 0.5 μm per meter) for distances between 0.02 m and 30 m.
Absolute measurement of lengths up to 30 m with unrivaled precision. Monitoring of deformations in rough manufacturing environments. Reliable production processes thanks to continuous monitoring of production means. Up to 124 channels allow for setup of complex metrological networks. 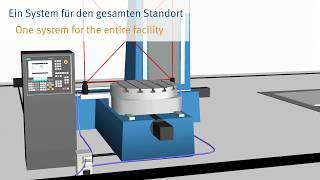 Continuous monitoring of large machining centers. Automatic detection of deformations and vibrations of (thermo-) mechanical systems such as generators, turbines or pressure containers. Geometrical control of rigs and fixtures. 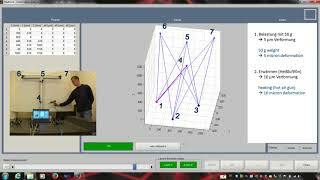 Automated metrology monitoring of robots based on reference lines. Global metrology system for monitoring the entire inline measuring technology of a production hall. Measurement range up to 30 m.
Laser class II m, eye save.